So I made the jump and forked out for a shiny new SSD hard drive as I was getting increasing frustrated with the amount of time that windows was taking to startup and I thought that the decrease in-game loading times would be nice. So after doing some research on a couple of websites mainly SSDReview.com. 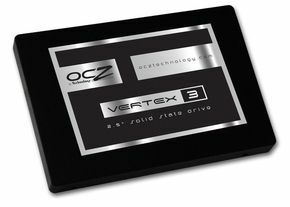 I finally settled on the 120gb ocz Vertex 3 Which I purchased from Ebuyer.com now this ssd is sata 3 compatible and although I don’t at this time have a sata 3 port on my motherboard the price and performance the disk was showing was good and its also fully compatible with sata 2. One of the Important things to rember about SSD’s contrary to more traditional hard drives is that the larger the storage capacity the faster they tend to be. There are cheaper options around with smaller capacity but the general consensus seems to be to go for no lower than 120GB. Now this particular ssd is a 2.5″ drive but thankfully comes with an adaptor that allows it to fit into desktop cases. The drive just screws in to the adaptor with the screws that are provided and that adaptor is screwed into the case. This is where I hit a slight snag. The drive fitted into the adaptor absolutely fine as you would expect however, I have a Antec Nine Hundred Two and the screws to fit the adaptor to the case were too small for the thick walls of the drive bay. The adaptor has rather small bolt holes that have a fine thread and I was unable to find any that were over an inch long that were thin enough and had the correct thread. I ended up screwing a couple of the screws from the inside out and for the ones that were too tight using some sandwich bag ties to make sure it was secure. Not ideal but it works and because the ties are plastic coated perfectly insulated. That minor problem out-of-the-way the rest of the installation of the SSD went fine and it was onto installing windows and restoring backups. Thankfully installation of windows went pretty well as did the restoration of backups the next job on the list of things to do was to see what the windows experience score was the first run was 7.1 up from its previous 5.9 however the score was still limited by the hard drive score. So I googled to see if I could optimise the windows installation a bit more and prehaps clear some space off my already filling SSD. Enabling faster booting and adjusting power settings. I reran the windows experience test and received a new score of 7.3 the lowest score now being my graphics card the hard drive score had actually move to 7.4 so by just doing those steps id increased performance by .3 who knows what that actually means in real terms but an improvement is an improvement. My final job was to move My Documents off of the SSD and onto the other Hard Drive another google search and a couple of rather complicated solutions later I actually found this [Click Here] posted by a guy called Headstrongfarm And discovered that its much easier than you would have thought. Windows does all the hard work for you all you have to do is tell it where you want to move the files too and it will move them to the folder you specify. So overall the installation and setting up was pretty simple and problem free. Windows definitely starts faster and the computer is more responsive, Time will tell how worthwhile it was and we will see if the speed keeps up especially as the windows install gets older. If your thinking about going the route of SSD I would definitely recommend it spend what you can afford but don’t go lower than a 120gb and as a friend of mine suggested don’t go by the specs the manufacture says go by what the benchmarks have to say a quick google search will bring up lots of review sites and most retail sites now also have a review system in place.